Akshay Kumar and Twinkle Khanna are one of the hottest celebrity couples in Bollywood. After sharing a great personal relationship, the two have turned professional too as Twinkle turned producer for the recently released film Padman. Twinkle and Akshay were snapped at producer Ritesh Sidhwani’s office in Mumbai on May 17, 2018. Ritesh, Twinkle and Akshay were engaged in a conversation as they walked out of the office. 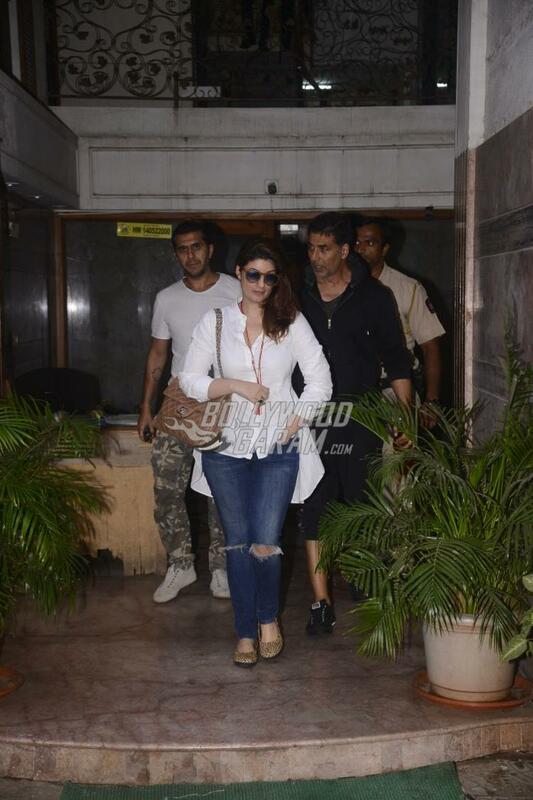 Twinkle looked pretty in a white shirt, and blue ripped denims while Akshay was seen in cool casuals. Producer Ritesh was seen in a white t-shirt and camouflage pants. Akshay and Twinkle were recently in news for auctioning a costume from the film Rustom. 21 people had sent a notice to the actors for trying to auction the costume. The notice read, “Uniforms resembling those of the armed forces pose a potential threat to national security as the said uniform, insignia and badges could pass for genuine service clothing and can find their way to anti-national elements who can use it to foment trouble”. Akshay was last seen in the film Padman which was based on a social issue of menstrual hygiene among women in the rural areas.